I owe Molly Stevens big-time. Not only did she write a great book about braising, which is one of my very favorite ways to deal with meat, but the woman knows how to make cooked carrots taste great. I myself am no friend of cooked carrots: they get mushy and overly sweet with that same flavor that I dislike in sweet potatoes and squash. The thought of carrots cooked with brown sugar or ginger gives me the shivers, just a little bit. But I trust Molly with carrots because the glazed ones that accompany her Zinfandel-braised pot roast were a revelation to me: very savory with only a trace of sweetness, cooked to the perfect degree of doneness between crunch and mush. So I decided to break into a fresh jar of ground ancho from Penzey’s, and give this recipe a try. It came together quickly, even though I used full-sized carrots split down to baby carrot size, and the honey and spices hit just the right balance with the natural sweetness of the carrots. I do admit that I left out the jalapeño, and my tongue thanks me. To go along with this vaguely Tex-mex recipe, I decided a batch of scallion-sour cream corn muffins was in order. Turned out I didn’t have quite enough sour cream, so I snuck some of Nolan’s cream-top plain yogurt in to make up the difference. These were pretty good basic muffins, though I personally prefer to slather my warm cornbread with butter and honey, and couldn’t bring myself to do it thanks to the green onions. Nolan was a big fan of the entire meal, but he particularly liked the muffins. The next day I started breaking one up into bite-sized pieces for him at lunchtime and had to run out of the room for a moment to help Jeremy; when I came back not 30 seconds later, Nolan had ditched the little bites and was happily noshing on the entire muffin like a big boy, buried in crumbs. Now I just break them into halves or quarters for him instead. We also got some pretty fantastic leftovers out of the pork, which was good because there was just over a whole tenderloin left. 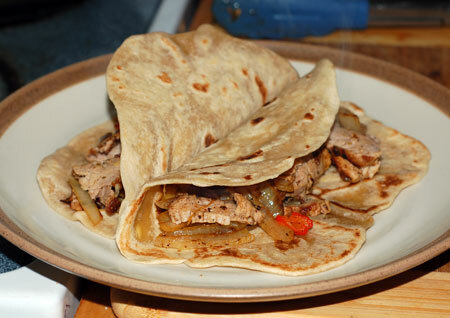 I made my homemade tortillas, upping the quantity slightly because we go through them pretty quickly; sauteed some peppers and onions; and added thin slices of pork just to heat it through. Add some cheese, sour cream, what have you, and you’ve got some darn good pork fajitas. I should also note that Penzey’s is really onto something with those little samples they send along with their online orders. It can be a little hard to imagine how a particular spice blend will smell and taste over the internet, and those samples really help. I find myself reaching for the sample jar of southwestern spices almost every time I make Mexican food now, and I strongly suspect that when I run out, I will be adding it to the next order. Please note that I adjusted the cooking method on the carrots here, due to timing and a few cautionary reviews about mushy carrots. For carrots: Arrange carrots on a large rimmed baking sheet. Whisk water and all remaining ingredients in small bowl; pour over carrots and toss to coat. DO AHEAD: Can be made 2 hours ahead. Let stand at room temperature. Toss to coat before continuing. For pork: Preheat oven to 400°F. Roast carrot mixture for about 10 minutes while cooking off the pork. Meanwhile, stir oregano, cumin, chile powder, smoked paprika, and 1 teaspoon coarse salt in small bowl; rub mixture all over tenderloins. Heat oil in heavy large nonstick skillet over medium-high heat. Add pork to skillet and cook until browned on all sides, about 5 minutes. 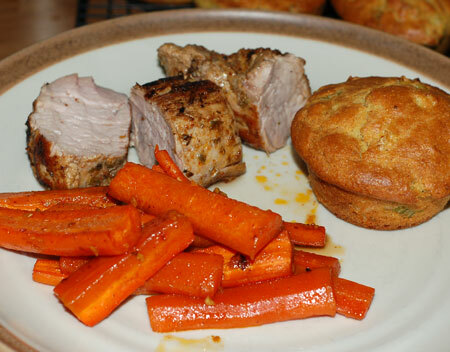 Remove tray from oven and place pork with the carrots in a single layer around it. Roast uncovered until instant-read thermometer inserted into center of pork registers 145°F, stirring carrots occasionally if beginning to caramelize, about 18 minutes. Remove pork from the oven and allow to rest for 5 to 10 minutes; meanwhile, check carrots for doneness and return to the oven while the meat rests if not yet tender.